Hello all and a very Happy New Year!! I didn’t think I had too much to offer until I went through my IG feed from 2016. This is where I list all my makes as a record and I was surprised and encouraged. I sponsored the Kickstarter for Ernest Wright which was massively successful. Participated in Me Made May 16 whilst on holiday. This is a real eye opener as to what you have and what you need. You really see where the shortages are. We ‘up North’ also get to see lovely summery tops and dresses in the South on IG whilst still wearing our Lindens! Whilst on holiday I also realised I needed a portable craft hobby and on my return taught myself (with help from the Internet) how to knit socks. I now have eight pairs and made a Stowe bag to keep my project in. Makes included 1 blouse, 2 leggings, 2 shorts, 3 skirts, 4 dresses, 5 knickers, 3 sweatshirts, 12 tops a cowl and a shrug. Some are more useable than others but I learnt so much from making them all. Unselfish makes were for Dogs Trust Christmas fair which I try to do each year. Sharing information, hints and tips has been a massive part of this year. IG, blogs and meeting people in real life has restored my faith. The start of the year was my first meeting of the Yorkshire Spoolettes and later in the year I visited Yarndale. So to 2017 and I just want the same and more. The only thing I have resolved to do is cut out the buying for a little while, well 6 months actually. Before Christmas I had to ‘find’ a dining room and spare bedroom for visitors and I had a little panic packing away fabric and patterns out waiting to be created. If I made an item each day for the rest of the year I don’t think I would repeat or even run out and that is shocking. My last make of 2016 was a TATB Cleo, thank you akathimberlina, with some beautiful Liberty Rossmore Corduroy that I bought from Sewbox more than 2 years ago. I have so many lovely fabrics that will need re washing before sewing and stash dipping can be exciting, so much to re discover. 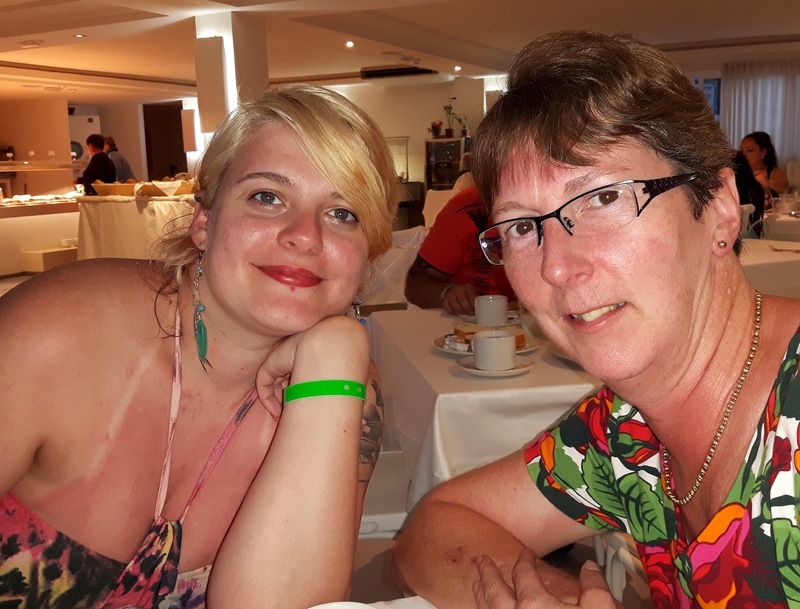 My namesake Karen from thesewingmiserablist has written a post ‘How long can 6 months be?’ and I have committed to join her and I am now looking forward to it. So each month I will record how much I have ‘saved’ by Sewing my Stash (think that will become my hash tag this next year. Wish me luck! So on that note and with a pity poor photo short blog, (thank you again Windows 10) I leave you with my last make of 2016 and a stash dip. Yes its mutton dressed as lamb but I love it!! Earlier this summer I came into some money (I sold my old phone, thanks son!) so what’s a girl to do but spend it on fabric!! I am sure if I sewed a different item every day I have enough fabric to sew for a year. Shameful or an investment? I just don’t like to miss a bargain! I bought a big bundle of fabrics from Fabworks and as they were all washed together I thought I should move them from the ironing pile to the sewing room, killing two birds with one stone. Smaller ironing pile and three new tops! First on the list is this swirly loud print, lovely and soft. I only bought 1m with the idea of using plain black jersey for the neckband and arms. This is the Hemlock Tee by Grainline Studios. There are loads on the Internet and IG and I can see why. A simple shape, one size only as its a freebie but not as loose on my fuller figure as on some. I am pleased how this has turned out and with jeans on a weekend it will get lots of wear. Scowling in the wintery sun, sorry. This is the Gable Top by Jennifer Lauren made in a really stable wool jersey. I can’t find it on the website but go and have a look. They have a sale on at the moment and there are bargains galore. I should have bought the bolt! It doesn’t fray and sews like a dream. Jennifer suggests joining the shoulders, sewing in the sleeves and sewing the sides so you can try it on before deciding on the neckline. You try it on and pin and baste to suit. I have a dodgy neck so I wanted the back neck to be higher than the front. It took 2 goes to get it right but I am really happy with the results. Looking at this photo I perhaps need a few inches off the bottom. Not sure, I will wear it a bit and see. The third make is the Blanc Tee by Blank Slate Patterns. Another free pattern if you join the Facebook Group. It’s good as others share their makes and alterations and it can be quite inspiring. This is the only time this tee will see the light of day unless its hung on the washing line. Nothing wrong with this Floral Polka Dot or the Blanc T because this is my new PJ top. Soft and comfy and tidy enough to answer the door. In fact because I have made it a bit big I think it will be good in some wicking fabric I have for a running tee. This is a little bit of unselfish sewing. My friend who now lives in Shoreham-by-Sea works at Dogs Trust. Each year I try to make some bits and bobs for them to sell at the Christmas Fair. The basket has little stockings with gold hangers. On the front I Bondaweb little bone shapes in Xmas fabric and inside there are some doggie chews. The basket on the left has tissue holders, glasses cases and poo bag holders with lobster clasps to clip to the dogs lead. They came to visit last weekend so I sent her home with them in good time. Sock knitting is going well. The Opal is amazing!! Look at how it knits up, its no effort magic. This was like fabric origami. 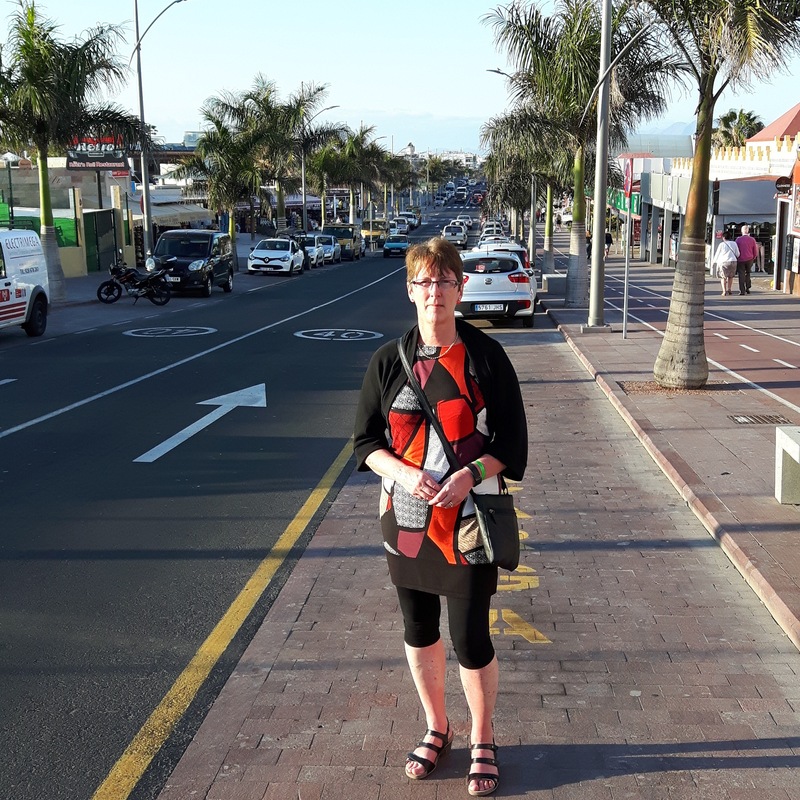 Its the Hey June Santa Fe Top I made it in some Coral Art Gallery jersey I bought from The Village Haberdashery (hey I have shares I have to keep buying) and Etno Looming from The Drapers Daughter. These fabrics are a joy to cut and sew. They also wash and wear well. You get a lot of variations on this top and I will be making more. Actually I have a few Hey June patterns and they seem to suit me well. A few of you (well most of you) refer sometimes to your growing fabric stash. I have decided each month I need to ‘stash dip’ and just use what comes out. Sometimes a fabric slides out and I think ‘Oh wow I forgot about that’ and other times I think ‘what was I thinking!’ This months fabric dip was a scuba I bought from Minerva Fabrics 2 years ago when I went to their open day. It said shorts to me. As the Belize pattern had just been released by Itch to Stitch that was it. This is another versatile pattern as it also has a skort version too. As I only had 1m shorts it was. These are a great length for me and being as loud as they are will go with any colour tee. Scuba will be great for holidays as it washes and dries easily and doesn’t need ironing, perfect in my book. Simplicity 2226 is a skirt everyone has made but me. The sewalong suggests making the waistband first as its a big fit. I took the advise, made it up, putting in my first zip. Yes we all have to start somewhere, do you remember your first zip? Result was massive. But the fabric is so lovely I have had to take it apart (don’t you hate that). I have left the zip attached and am just taking in the sides of the waistband and re gathering the panels. It will have to be lined but I should be able to wear this as an autumnal item. Last month I went to Yarndale. A woolly gathering at Skipton Action Mart. This was a riot of colour, yarns, people and crafts old and new. Spinning, felting, knitting and crochet everywhere. I did succumb to a few hanks of sock wool (did I mention its addictive). The entrance was covered in bunting and little knitted or crochet sheep. The sheep had been donated by people all over the country and some even from abroad. I follow the blog of Postcard from Gibraltar and I knew she had posted over Llanita and I found her. Not Mrs Postcard (we missed each other) but Llanita and I brought her home!! The green and cream wool to the left has little flecks of colour in it and its not really my colour but its called Gin & Tonic so it had to come home with me. The middle one is named Explosion in a Dye Factory by Sylvan Tiger. Its already been knitted and today my friend from Shoreham by Sea went home wearing the socks. Quite appropriate as she and the wool are from Leeds. So that’s summer finished for this year and we are onto Autumn. I have some lovely cord to make a skirt with and I must make a Coco as I think I must be the only sewist not to have made one. Yet! 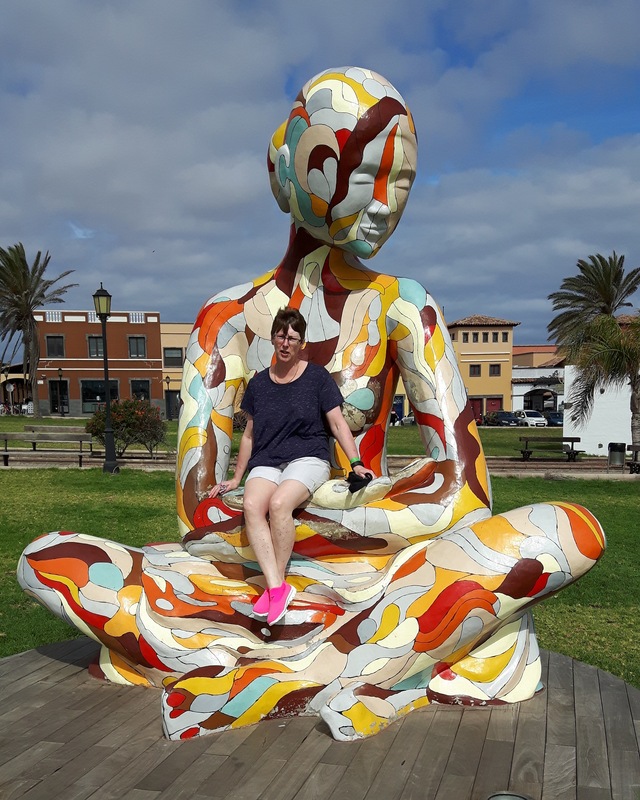 As with blogging my MMMay16 was a little toe in the water. Although I have been watching you all for the last four years I only really started making things this year but after the success of my Me Made Holiday I had to give it a go. Weekends aren’t a problem as I wear casual most of the time except for when we went out to Papas Fish Restaurant for Pats birthday (FIL’s girlfriend) and I wore my Lady Skater dress. But I wanted to address my main dress problem for work. I work with Management in an accounts office where the men all wear suits. I am not nor ever will be an accountant but still need to look smart. As soon as May comes around some others get out the flip flops whilst I am still in black skirts and court shoes. Yuk, I need more colour. One top I made last month was the Scarlett Cowl by Patty Do English, only 2.99 Euros this looks ok with my plain black skirt. As my tummy is as wide as my hips I need to go back and take off the flare. This is one of those wash and wear viscous jersey fabrics for less than £10 per metre that doesn’t need ironing. A winner in my book. Next came 2 skirts. Dragon Fly fabrics sell offcuts and I pounced on a 80cm offcut of their Raspberry Ponte Jersey for about £7 or £8, perfect for a Mabel. I didn’t fancy the negative ease, having a round tummy, thank you, so I cut a large but it was massive. So I just re over locked the seams again, trimming a few cms off all around. I have left it unlined for now but for winter and thick tights I will either line it or make a suitable underskirt. The next skirt I made was the Liesl & Co Everyday Skirt. Girls this is a fabulous pattern. It has a front, back and sides. The front and sides are sewn together and then the front is gathered slightly so it all matches the waistband length. The waistband is sewn on and then top stitched. I hand basted it first to keep it all tidy. My Bernina came with a blind hem foot which I lined up against the edge of the waistband and moved the needle over until it did a lovely topstitch. Then the back it sewn on. This is higher than the waistband on the front and sides so when sewn on it folds over level making a casing which you separate into two channels to insert elastic. Wow that sounded more complicated than it is. Basically you have a front with kind gathers, flat sides so you don’t look too hippy and a gently elasticated back. OMG I forgot to say, it has pockets too between the front and the sides. My last make was my second Moneta in some lovely weight, randomly dotty, aubergine jersey from Fabworks. I only live and work about 3 miles away so I went to collect my order in my lunch break. Chatty me ended up meeting the family (including Lucy the dog) and having a little tour around. Let me tell you girls this was torture!! Lovely people, yards of stunning fabric. I just want to go work there with them all now (please George I am very versatile). The Moneta has turned out lovely and will be perfect for work. I see a lot more of these in my life and in Autumn I will just make more with longer sleeves. The other bits I mentioned are socks. I don’t know about you all but I sew upstairs and sometimes feel a bit guilty leaving hubby (unless he is watching the Motor Racing) alone for too long. I found one set of 4 needles in my house (far too big) and a kind beginners pattern on line and had a go. I love sock knitting now. So much so I ordered the right size needles for the wool and pattern I have (and more wool and a book). I am now on my third sock. Having one to fit Big Foot and 2 for me. I put the two different sized socks on IG to show how important tension and the right size needles is. Then obviously I needed a bag to carry around my project. We have a market in Morley and there is a curtain making stall where they sell the offcuts for £1. Bargain. The bias binding cost me more at £1.20 so for £2.20 I now have a medium Stowe Bag. So all in all a really good month again. I feel I know a little better how to change my work wear and just need to keep filtering more of it in. Wow #MMMay16. This is my first with a blog and a gentle commitment but I have been watching probably 4 years and I find it so inspiring. New makes, refashions, hidden gems forgotten about. I am trying to address workwear. Fitting in with men in suits without dressing in black everyday. Anyway. Before that kicked off hubby and I needed a little break and some sun. 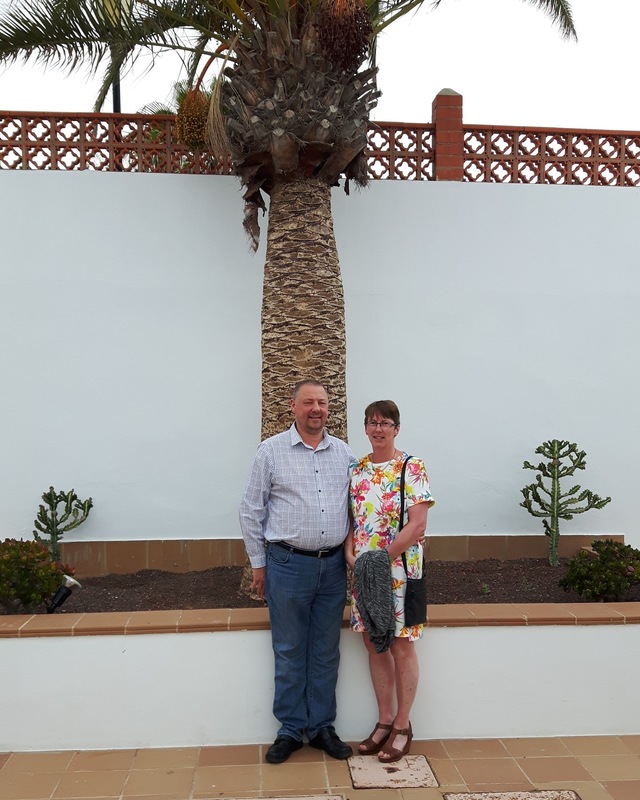 Our boy and his girlie felt the same so we joined up and booked a late holiday to Fuerteventura. 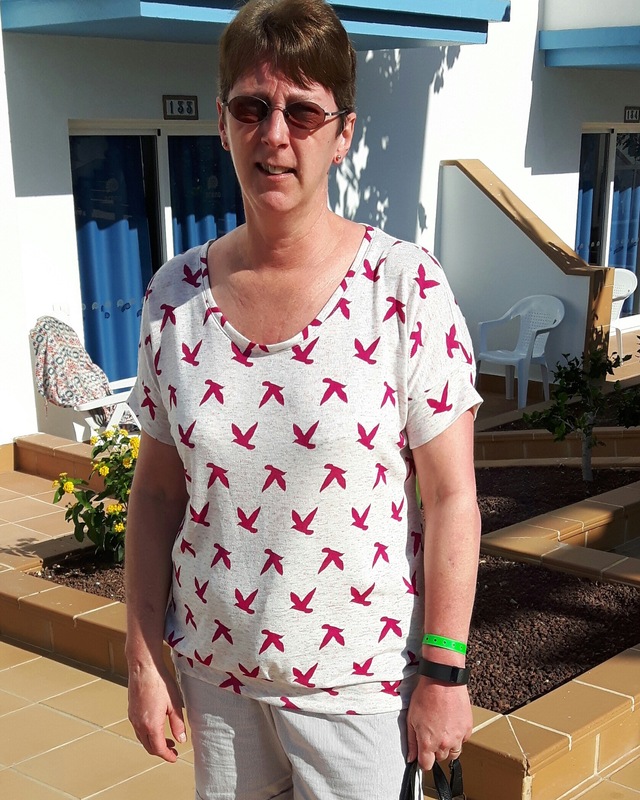 As the weather had warmed up a bit in Yorkshire I decided to sort winter clothes away and pulled out my me mades and was a bit shocked how much I have so decided to do a #mmholiday. Travel to Manchester Airport. Hubby had a bad cold and I had started with a very sore throat. 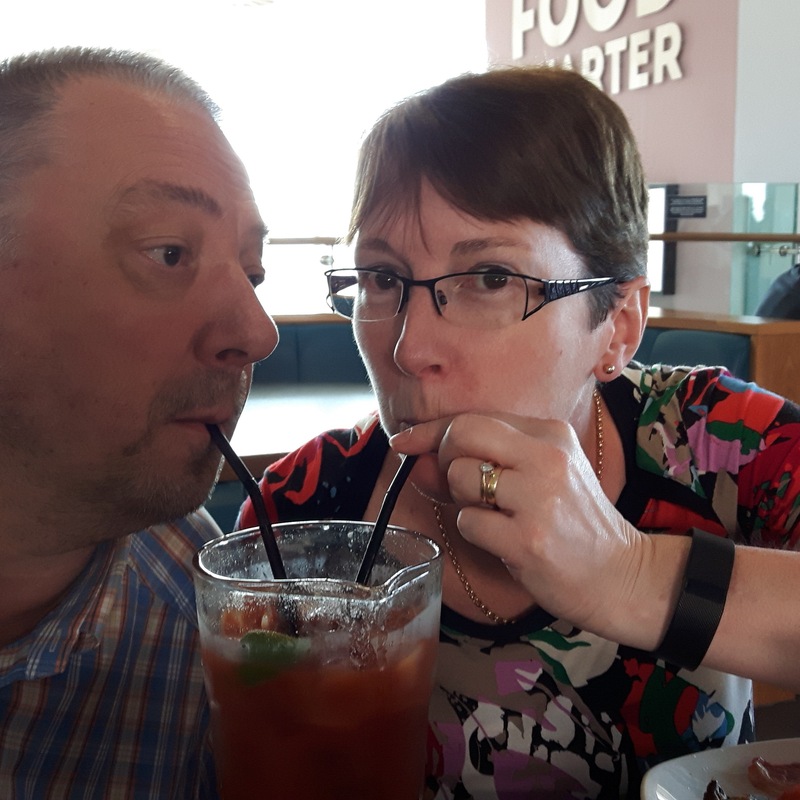 Hubby found me some anaesthetic in the form of a jug of Bloody Mary, yum. Here I am wearing a ﻿Bronte Top by Jennifer Lauren made from some lovely jersey from Minerva. I had forgotten how lovely this top is and must make some more. Keeping the cool evenings warm in my merino shrug. Fabric from KitschyCoo pattern is the Wendy Ward ﻿Brightside Shrug﻿. Need this in summery colours now. Easy to sew and lovely and snugly to wear. Maria Denmark Olivia Oversize Tee﻿ in ﻿﻿hacci sweater﻿ knit﻿ from Girl Charlee Uk. Going to try this in jersey next, it’s a relaxed fit. Sorry this is really tacky. 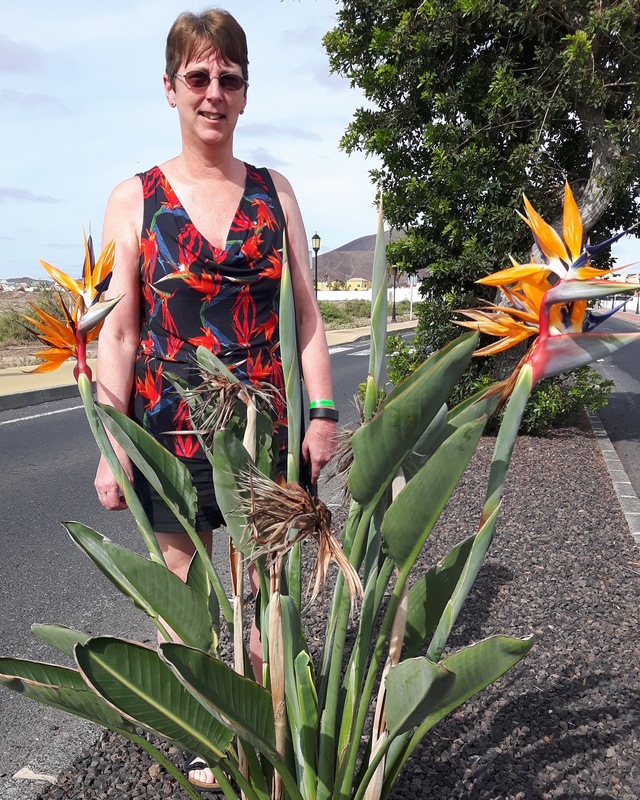 Birds of paradise jersey from EBay last year made into a Maria ﻿Denmark ﻿Drape Top﻿﻿. Perfect for holidays. I am stood in the the middle of the road I hope you know! Me and my hubby. Very comfy in my ﻿Inari Tee﻿ dress made from ﻿Waikiki blooms﻿ from Fabworks Mill shop. This was a steal at £6pm. I made the sleeves as cuffs as it seemed to suit the fabric better than a turn up. 2 for the price of 1. Bargain fabric from B & M Leeds bought some time last year for £5. A Maria Denmark Signe Top and a Wendy Ward ﻿Walkley Top﻿. 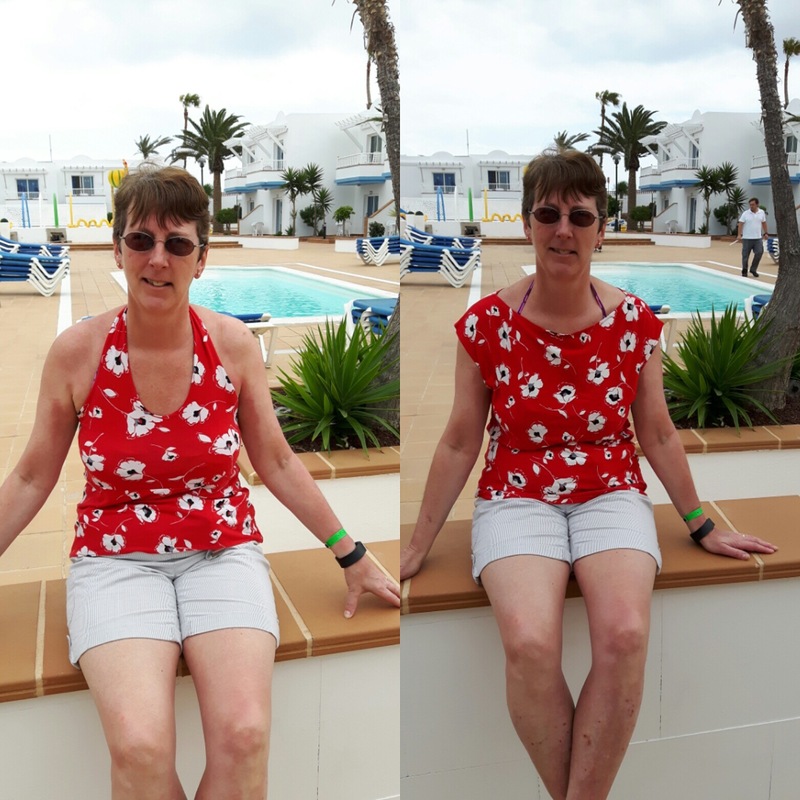 Two tops perfect for hols. Gosh I love this dress. I spied ﻿@redwsews﻿ version on IG and bought the PDF straight away. I had this made in two days. The fabric is one of those lovely heavy jerseys that drapes beautifully. There will be more as work wear. 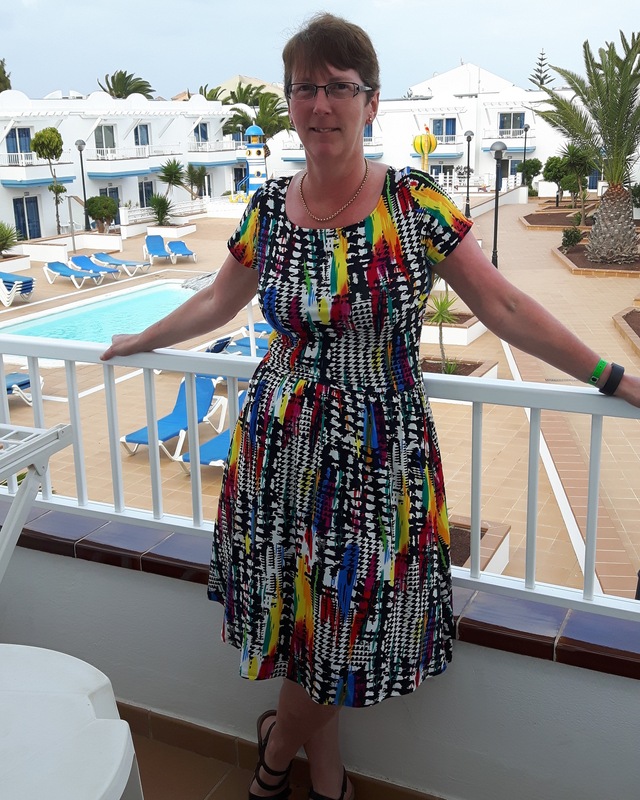 Colette patterns ﻿Moneta dress﻿. Fabric from North Bar Fabrics in Cherry Burton. A little gem of a shop. 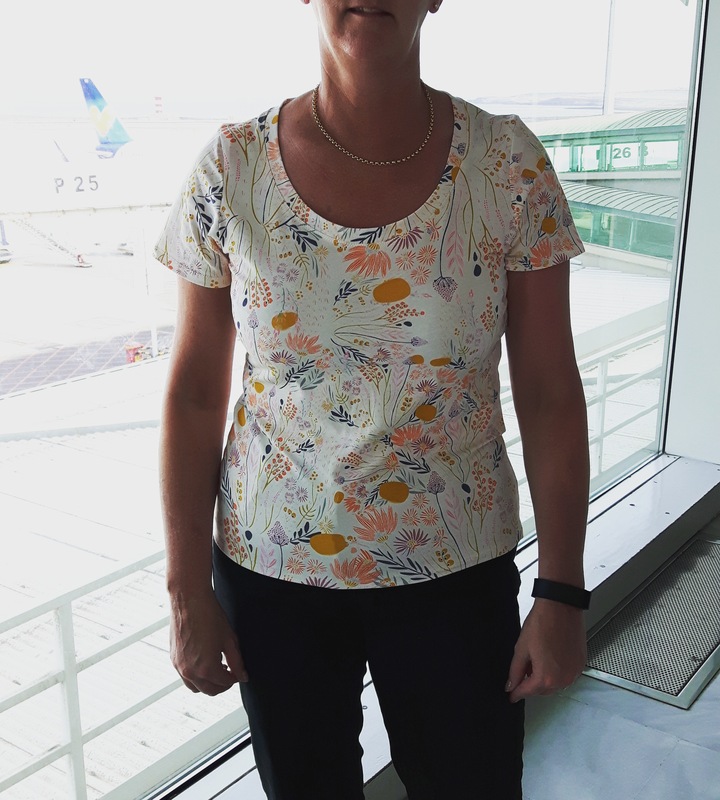 Holiday over and back to the airport in my Maria Denmark ﻿Birgitte Basic tee﻿. This is made in a fabulous Art Gallery Knit from M is for Makes. No longer in stock in this colour way. It’s not cheap but this fabric is lovely to sew and washes and wears well. This could be my new favourite tee pattern. This was great fun. I fully understand now why people do MMMay. It has really inspired me to make more of what I need. Right off to plan more workwear. At the meeting of the Yorkshire Spoolettes last month a number of us bought similar or the same fabrics (great taste ladies). 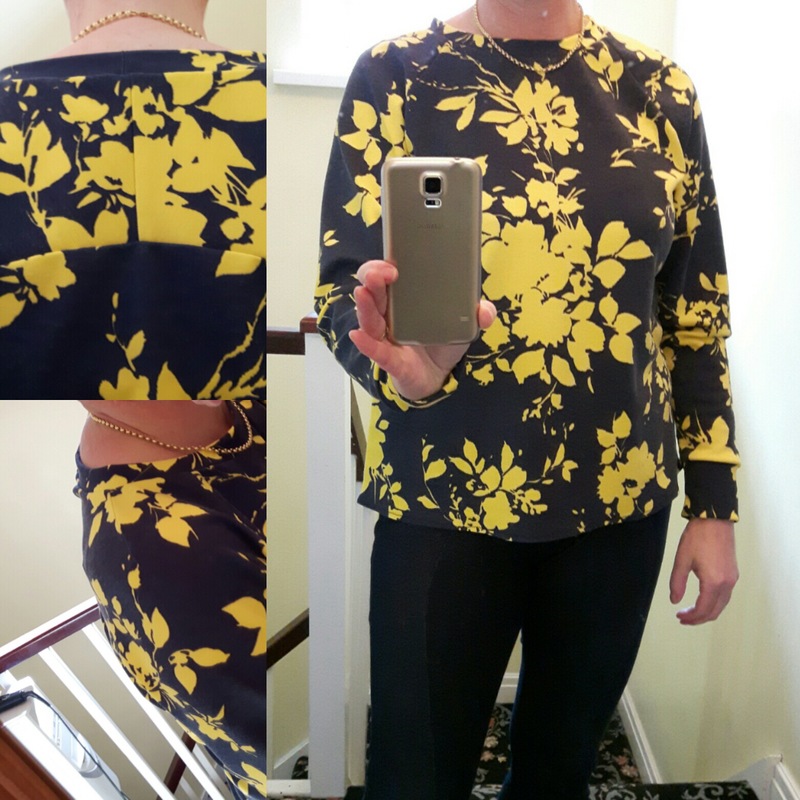 One I bought from Fabworks Mill Shop was this Lemon Blooms ponte double jersey £6 pm bargain!! Ruth made it into a dress, fabby Ruth but I wanted to try the short sleeve Linden option B. What a versatile fabric. 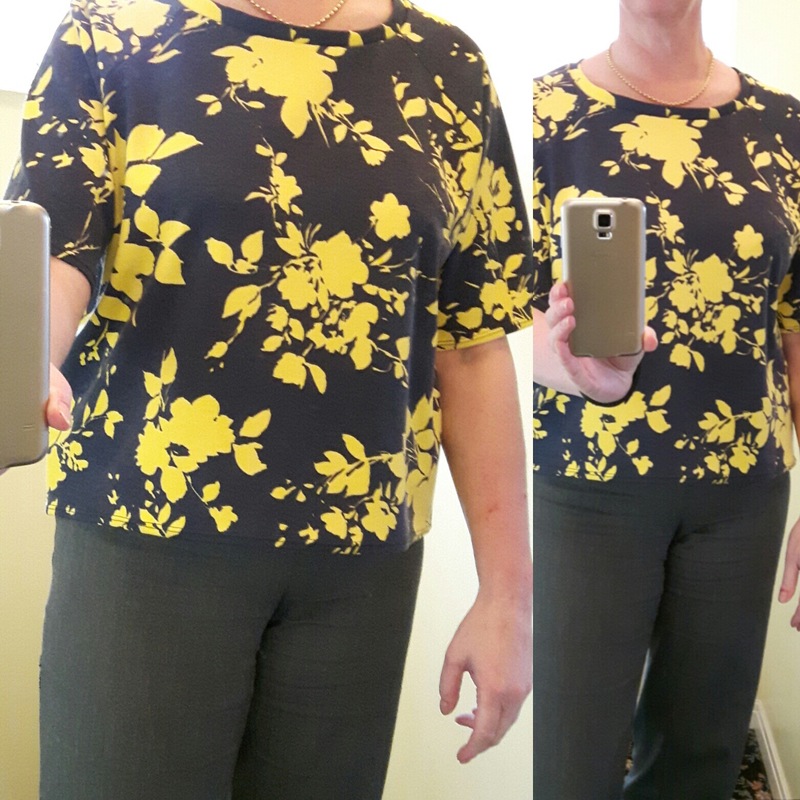 The Linden is so easy to make and with the short sleeves it’s a breeze. I imagine this with a pair of denim shorts . Cuffs and hems are just turned and twin needled. I bought 2m of this fabric and at the same time I cut this out I squeezed on a Bethioua Raglan. Seriously you need to google or IG this top. The sleeves are large and darted at the shoulder then go across the top of the shoulder to form the top of the back. In a stripe fabric this means the back meets with a chevron shape. I have quite wide shoulders so until I get more practice raglan is good. This fabric doesn’t show off the pattern well but you can see the dart on the shoulder in the left bottom picture and the back where the sleeves meet on the top left. There is a choice of two cuff options fitted and loose fit. I chose fitted. My Fitbit is just behind the cuff but comfy as I tried this on yesterday and didn’t take it off. Also two choices of hem. Straight at the front and curved at the back or straight all around and a hem band piece. As I am wearing this with my Ooh La Leggings I went for bum covering curved hem. Two very easy and quick makes and both I will make again. I also bought some Waikiki blooms and yes it’s loud but lovely don’t you think for the short Linden for holidays? Looking forward to seeing the makes of the other Yorkshire Spoolettes.